Colorado G.I.R.L. : Tiffany Willard, M.D. Girl Scouts is kicking off their 100th anniversary celebrations by naming 100 Colorado Girl Scouts as the leaders of tomorrow – the Generation Wow! Generation Wow! recognizes outstanding girls whose individual achievements in Girl Scouts, their schools and communities set them apart as leaders. Girls who earned this honor exhibit a high level of volunteer achievement and make significant contributions to their community. They demonstrate strong leadership skills; participate in service and learning projects. They exhibit achievement in developing a healthy attitude, both mind and body, and demonstrate exceptional interpersonal skills in teamwork, conflict resolution and goal setting. They embody the vision of Girl Scouting. A committee of outside civic and community leaders from throughout Colorado helped select these recipients. View the list of the 100 Girl Scouts who have been named to this honor as well as learn more about the activities they are participating in as well as the regional events where they will be recognized. Scout since 2002, competed and earned a spot (only 40 girls nationwide received this honor) to go to Houston, Texas, to participate in a NASA program. She is in Girl Scout Troop 23 in Colorado Springs and is in Service Unit 13. The Walmart Foundation recently awarded Girl Scouts of Colorado a $25,000 grant in support of Forever Green, Girl Scouts nationally-developed program that teaches girls how to lead their families, schools and communities in improving the environment and protecting natural resources. The program will be delivered statewide, and over the next year will coincide with activities Girl Scouts is planning around the organization’s 100th anniversary. Girl Scouts of Colorado Forever Green activities this year will focus on three major projects—reduce plastic waste, Earth Hour and rain gardens. Through this program, Girl Scouts will develop and use their leadership skills to impact the environment by working with their schools and communities to improve energy use, water use and waste management—specifically recycling. Participants will take action on efforts to reduce the number of plastic bottles and bags in landfills, lower their CO2 footprints and encourage sustainable behavior change, increase green space and wildlife habitat, and improve water quality. 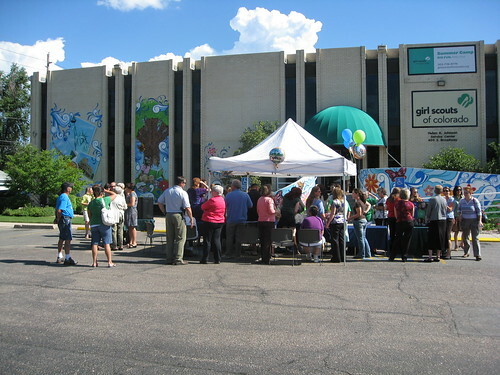 The Walmart Foundation initially seeded the Girl Scouts of Colorado Forever Green program in 2009. Article about grant award in The Fort Morgan Times and the Sterling Journal-Advocate. designed to excite, inspire, and prepare girls to become leaders and encourage them to take action in the world around them. meals, activities, visits to the beach, etc. Want to “Rock the Mall” with thousands of your Girl Scout friends from across the nation? sites. Don’t miss this fun, exciting and educational trip! planning committee by contacting Penny Roberts at robertpm@co.larimer.co.us. Erik Weihenmayer, the only blind person to reach the Seven Summits. The GSCO What’s Your Everest Retreat is designed to highlight female leaders and guest speakers from the National Park Service and other partner organizations. The girls were thrilled to see themselves on the front page of the Fountain Valley Newspaper this week. Click here to take a peek. Two girls from the troop are not pictured here but they all worked very hard selling cookies and used some of the money they earned to buy coats for needy children. They also each brought a few items of their own to donate as well. They donated them to the God’s Pantry in Fountain. It is run by a great woman who spends about 80 hrs a week there getting things set up to help others. They have a program to give families free clothing for children each month, household items for a small price and boxes of free food for those that need it. I am very proud of my troop. Each of the girls are very caring and truly want to help others. I can’t wait to see how much we will be doing this coming year. 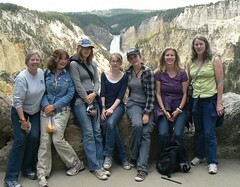 [slideshow]The girls of Arvada’s Ambassador Troop 299 have been together for over a decade. Alyssa, Nicole G., Tara, Abby, Kaleigh, Karli and Nicole B. spent nine wonderful days in sunny California seeing the sights and experiencing life at the ocean. Two years of preparations went into this trip, including fundraising and doing prep-work on multiple Council’s Own Interest Project Awards. Some of the IPA’s earned on this trip were Lighthouses, Quake Safe, Ocean Discovery, Marine Life, Surfing and Smooth Sailing. Being prepared made the hands-on experiences richer and more meaningful. Several days were spent in San Diego, walking the hills of the San Diego Zoo and visiting Shamu, dolphins and other sea creatures at Sea World. Then it was on to Anaheim where we stayed within walking distance of Disney Land. California Adventure and Disney Land parks were days filled with exhilarating rides and wonderful Disney productions, along with breathtaking evening water spectaculars and sensational fireworks. A day in Hollywood visiting the stars and eating on Sunset Boulevard was exciting. Many of the Girl Scouts had never experienced lazy days on sandy beaches and ocean activities. There were boat rides to Catalina Island with a morning of snorkeling in the coves and an afternoon of white sand beaches. Sailing lessons took place in Newport Beach where the girls maneuvered a 20-foot sailboat through the bay. The best day of all – surfing lessons! Our Bridging Ceremony to Ambassador Scouting took place on the Catalina Flyer ship. It was a simple ceremony with flowers. The sea was rough and windy making the day even more memorable. Throughout their years together, friendships have blossomed, leaders have been born and many adventures have taken place. The girls are looking forward to celebrating Girl Scouts 100thAnniversary together as they continue together on this adventure called Girl Scouting. NBC 9NEWS based in Denver helped us cover the mural celebration live on their morning newscasts. View the news coverage. Girl Scouts of the USA also shared the exciting news on their Blog and Facebook page. If you haven’t had a chance to come by and check out the new mural, we invite you to our offices at 400 S. Broadway in Denver soon. This mural truly celebrates all Girl Scouting is and will be for centuries to come! Girl Scout Juniors Troop 255 of Woodland Park, recently completed their Bronze Award, the highest honor a Girl Scout Junior can earn. The Bronze Award requires the girls to express their leadership and planning skills as they follow through on their selected project, which is aimed at benefiting the community. Troop 255 demonstrated its commitment to helping others and helping the community by working with the Ronald McDonald House of Colorado Springs, which is a nonprofit organization that provides a home away from home for families whose children are seriously ill and hospitalized. Troop 255 has been working with the Ronald McDonald House since Daisies by collecting pop tops. Troop 255 are group of wonderful, adventurous, young leaders and they are: Taylor A., Hanna C., Saralyn C., Ashley D., Tess K., Jaclyn K., Emily H., Maia P., Autumn P., Tabatha R. and Reagan W.
500 in toiletry items, food items and cleaning supplies for the house. A 4’x3’ mural was designed, drawn and painted by all of the girls and depicted a scene of “Wishes of Hope and Love” that now hangs and brightens a hallway of the family living quarters at the house. On April 30, 2011, Troop 255 delivered all of these items, plus 25 pounds of pop tops, to the Ronald McDonald House and hosted a dinner for the families and volunteers of the house complete with a baked ziti dinner, table decorations and music. Way to go Troop 255! You all are awesome! Xcel Energy recently awarded Girl Scouts of Colorado a $15,000 grant to support its science, technology, engineering and mathematics (STEM) programs. The grant is specifically designed to help Girl Scouts of Colorado encourage girls to explore STEM and fuel the pipeline for the anticipated three million more scientists and engineers that America will need when today’s girls graduate from college. Programming will be delivered to girls statewide, with an emphasis on metro Denver and Colorado Springs. Girl Scouts of Colorado incorporates fun and educational STEM activities into all aspects of the Girl Scout experience from camp to troop activities, badge work, events and community outreach programs. One of the focuses of Girl Scouts’ STEM programming is introducing girls to women who work in STEM fields. 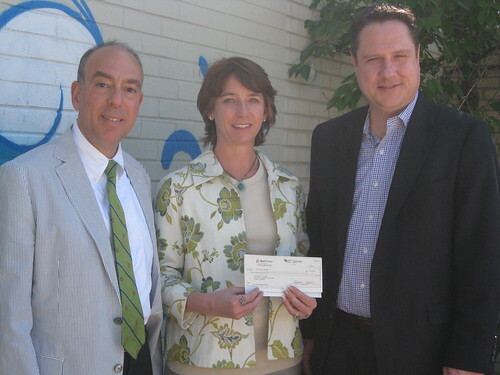 Pictured below is Kirk Scheitler with Xcel Energy (right) as he presents a $15,000 grant check to Girl Scouts of Colorado for science, technology, engineering and math activities. Girl Scouts of Colorado staff pictured are Megan Ferland (center), president and CEO, and Greg Movesian (left), senior vice president of resource development. Find an info night near you! Girl Scouting builds girls of courage, confidence and character, who make the world a better place.